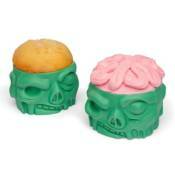 Zombie Baking Cups:Zombies take over your sweets with these Zombie Baking Cups! Brains can be delicious according to Zombies, so why not see what all the hype is about! These food-grade silicon cups are designed to hold gooey brain batter in the zombie heads. After baking, let the brains cool and decorate to your heart's delight! This set of 4 baking cups is the prefect treat for your nextWalking Deadscreening or any party! Each cup measures about 2-inches tall and is dishwasher and microwave safe.